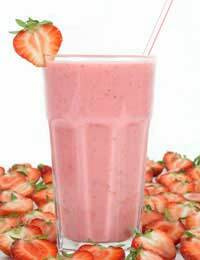 Even adults and children who usually give fruit a wide berth, will drink it down happily in a smoothie. Easy to prepare - and even easier to drink - these foods in a glass can kick-start your day or be enjoyed for lunch or supper or anytime you feel hungry or thirsty. The recipes will help meet the requirements for protein, fruits and dairy foods that are part of a healthy daily diet and the combinations are endless. Fruit is naturally high in carbohydrates, but the calories from these are easier to burn off, unlike those from fat. Because fruit is the main ingredient, smoothie recipes are generally very low in fat and high in fibre, leaving you feeling full and energised. If you are liable to become hooked on these delicious concoctions you may want to buy extra fruits in season and to freeze them for use in your drinks. Straight from the freezer they make a deliciously cold drink in the summer months, although this isn’t necessary if you have a ready supply of fruit. Simple, and full of Vitamin C and potassium, this is a popular, low calorie smoothie. Pour orange juice into the blender. Add the strawberries and bananas and blend until smooth. Orange juice is also the basis for this delicious smoothie of summer fruits. Pour the juice and fruits into the blender and blend until smooth. This very low calorie smoothie recipe is refreshing for a warm summer day. It combines honeydew melon and mint and is full of flavour. Looking and tasting like a latte coffee, this smoothie is an indulgent, yet low calorie mix. Add coffee, milk and then bananas to the blender. Blend until smooth. While the blender is running add the ice cubes and blend until smooth. Pour into glasses and sprinkle with cocoa and cinnamon to garnish. Apples are a year-round fruit and are the basis for many fibre-rich, low calorie smoothie recipes like this one. Combine the yogurt, apple sauce and apple in the blender. Add the fresh apple and spices and blend until smooth. In a small saucepan combine 1 cup of chopped, peeled apple and 1 cup of water. Bring to the boil, reduce the heat and simmer for ten minutes or for as long as it takes for the apples to become tender and the water to evaporate. Mash and with a spoon or fork and cool before using. Cover and refrigerate any unused sauce. This recipe makes roughly 1 cup. This smoothie is rich in nutrients from the brazil nuts and apricots. Slice the peeled banana and, if using fresh apricots, halve them and remove the stones. Add the fruit to the blender with the remaining ingredients and blend until smooth. You could use a little sugar or honey in this recipe as an alternative to maple syrup, but the syrup works well with the nuts to absorb the selenium, a powerful, healthy antioxidant. Don’t forget you can also freeze smoothies and take them to work or on picnics. Use strong, self-seal freezer bags and they will thaw by the time you need them.